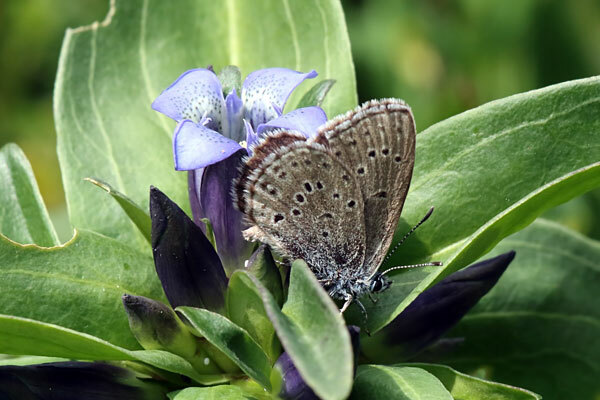 The male Mountain Alcon Blue has violet blue upper surfaces, and the female has blue basal areas interspersed with brown spots, similar to other butterflies in the genus. The undersides of the wings are a dark brown with small black spots that are circled in white. This species can be distinguished from its close relative, P. alcon, by the broader black margins of the male's upper wings, and the extensive blue basal areas of the female's wings. It is mainly found in northern part of Portugal and Greece, the western Pyrenees, south-eastern France, and eastern part of Germany. It is generally uncommon, and is regarded as Vulnerable. Its habitat is fairly dry areas at lower elevations, and damp meadows among trees at alpine elevations between 1000 and 2000m. There is one brood per year between mid-June and late August, depending on altitude. The larva feeds on Cross Gentian until its fourth instar, when it is taken into the nest of the ant Myrmica schencki, where it mimics the queen. It is fed by the ants.